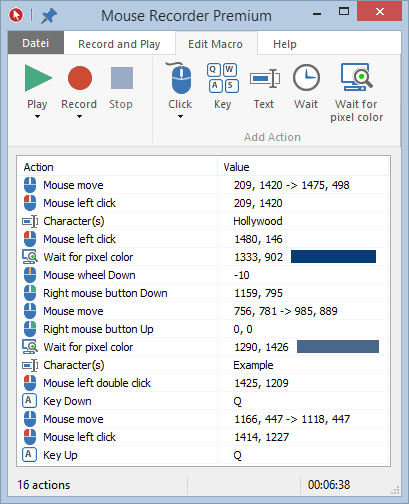 Mouse Recorder Premium is an automation program for repetitive tasks. The program functions like a "macro," or tool that records mouse movements, clicks, keyboard input and then plays back the actions infinitely at customizable speed. The program includes an editor allows users to enhance their recordings with powerful features. The advanced recording algorithm senses changes between record and playback conditions, such as moved or resized program windows, providing accurate, reliable and trouble-free Windows macros. The program can work in concert with PhraseExpress for additional features. Writes settings to: None if launched from USB thumb drive or with the command-line parameter "-portable"
How to extract: Download the ZIP package and extract to a folder of your choice. Launch mouserecorder.exe -portable.